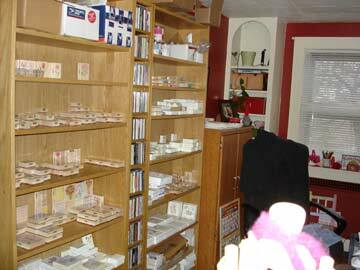 I have a rubber stamp store that I've been running for about 9 years now. Recently business has not been very good, but I have some loyal customers who special order from me. So... I'm closing up shop and going to a special order only model. What this means, is that I have a bunch of inventory to sell -- and I'm selling it at really excellent prices! Most of the items in my store are on sale, plus I have a coupon for you! Just enter CLOSEOUT during checkout to save 30% off your order. It will be sad to close the online retail shop, but at this point I just can't afford to pay for the pricey e-commerce package and the credit card processing fees. Hopefully this means I'll have time for something new and exciting in my life. Fingers crossed! I don't mention it here often, but I have a rubber stamp store online which I've run for over 8 years now called Stamping Online. Right now I have a promo going on -- 15 % off your entire order. Just use the coupon code HOLIDAY during checkout. Plus -- for my blog readers only -- mention BoogaJ in the order comments when you make your purchase and I'll send you a free Hero Arts catalog (filled with card ideas) as well as a free StampIt! (A ClearDesign stamp with some adhesive gemstones!) This sale and promo end on November 7th. Rubber Stamp Sale & Clearance! I'm not sure if any of you are stampers, but I have a big sale and clearance going on right now at Stamping Online. I just found a bunch of stamps and other goodies (watercolors & brushes, etc.) that were not on my website for some reason so I uploaded all of them and they were added to the sale too. There are some great deals to be had, so please stop by and take a look! It's been a crazy day -- the contractor is coming to tear up my bathroom tomorrow and Hero Arts released new stamps, which I had to put up on the website at Stamping Online. There are all sorts of these cute little sets that I love -- they have 18 stamps each which is fun. And I'm kind of digging this chocolate chip cookie background stamp too. None of these are in stock yet -- I'm ordering them tomorrow, but if you want to see the cuteness, they are all here. And there is still time to enter the chocolate giveaway! I've been selling rubber stamps online for over 7 years now and I have to say tha the big stamp companies always seem to be a bit behind the trends (or behind compared to the bloggers) so I was super excited to see that there were some awesome stamps coming out for 2009. I especially like the Woodland Creatures set and the Japanese Dolls set. And there are a *ton* of great owl stamps out this year! Seriously -- I've always been a fan of owls so these are right up my alley, but that aside, these are so darn cute! Did you know that I have an online rubber stamp store? I started it over 7 years ago when Maddie was little and I was jobless for the first time since I was 15. At any rate, I am having a little sale and there are some good deals. So if you are a stamper, or want to try it out, here is a coupon for you! Save 10% on your order at Stamping Online -- includes sale items! Enter "HOLIDAY08" in the coupon section during checkout. My office is a disaster! See, I have another business in addition to the knitting one -- it's a rubber stamp store which I've owned for over 5 years. I only sell Hero Arts stamps because I love them the best. I started it up because I needed something to do after Maddie was born and I have stuck with it all these years! Well, every December they release a sampling of their new line for the following year -- and it's insane! It comes in tons of boxes (instead of a few big boxes) and creates a huge mess. 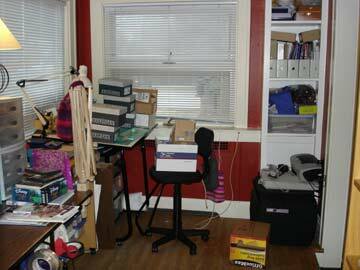 And I have to figure out where to cram all the new stuff -- the shelves are overflowing. So that's how my day is going -- quite a mess, wouldn't you say? Oh, the new stamps are *super* cute this year -- want to see? Just stop by my shop -- Stamping Online! Why I hate UPS !!!!!!!!! Okay, these two boxes just arrived. They were white when they left Hero Arts and presumably were in one piece. As you can see, they are marked with large stickers that say "FRAGILE". They have arrived as they always do, filthy -- and I do mean filthy -- ripped open and bashed in. It's absolutely ridiculous!! Especially when shipping for two boxes is like $85!! I have a rubber stamp business (Stamping Online) so I am forced to put up with this. I have complained, I have asked for a different method of delivery. Nothing doing. So I deal with this. And I'm forced to wait for Hero Arts to send me replacements for all the damaged products while my customers wait. I can't stand it. Grrrrrrrrrr. . . . . . . . But busy is good. And Maddie has been an angel the last couple of days. And my migraines are staying in check. And my new migraine medicine hasn't given me any terrible side effects. So mostly I can't complain. Off to do some more work! 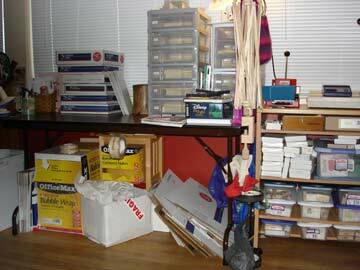 As this year comes to a close and I start to think about 2006 my mind settles on one major goal -- organization! As least in my office. I run two businesses and homeschool Maddie in this office and it's a mess. Maddie uses an old cardboard Kinko's box as her school desk (well, it is kind of good because the box holds all of her school "stuff" too) and she's getting a little big for that. Then there's the fact that I have two computers set up right now, but one isn't on a computer desk, so it's pretty much unusable. And there are piles of things everywhere! It's a mess. See for yourself. . . So, as you can see, it is a total mess. I spend a majority of each day in this office and I would love to have it look like a spread from Martha Stewart Living, know what I mean? I have patterns (currently in the plastic drawer thingies on the "shipping" table on southern wall) and rubber stamps (currently on two shelving units on the northern wall) that need to stay here and be near me for work. Two computers -- I want to set up the old one (which is currently not really usable due to its location) for Maddie. The second computer desk in the room is on the southern wall and is covered with my paper cutter, postal scale (which I use a lot and should have with the "shipping" stuff) and sizzix (which I don't use very often anymore). 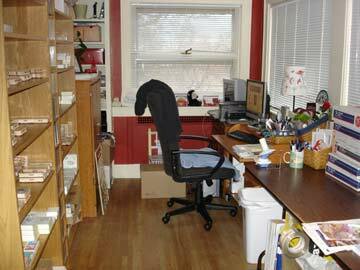 I have built-ins at each end of the room which you can see in the photos, but they need better organization. But how? Three walls are mostly windows, so I can't really put anything on them. This is good (natural light abounds!) & bad (only short things can be on these three walls). The eastern and western walls are metal below the windows -- they are actually radiator covers (yep, we have an old house with radiant heat). I have lots of files, but no filing cabinet. If I had a filing cabinet, where would I put it? Ugh! I don't know where to start. This is my biggest issue. I think if I start I'll do something totally wrong and have to start again and again. Is there a method I should be following? Help me! Here's where you come in. Send me links! Send me ideas! Send me photos! Help me out here! I'll pick a random name from the list of idea senders. And I will post a list of the best ideas (otherwise known as the ideas that I end up using or learning something new from) on the blog. You can post ideas in the comments, or email them to me! I have been knitting a little bit. I'm very close to finishing my Trekking 100 socks -- yeah! And I started a pair of mittens for Maddie, but ripped them out when I discovered that they were a bit too big. Sigh. . . So right now it's work time. Hopefully later this week I'll have some kntiting and spinning to show! BTW, I'm wondering if anyone has found any of the new Silk Garden DK for sale anywhere yet? Yarn shop owners & employees -- heard any news on this? *** Oh yeah, and our dishwasher broke. This isn't helping me out in the free time department on 2 counts -- having to wash/dry dishes & having to call/wait for a repairman. Oy! 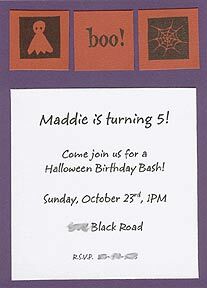 Maddie turns 5 at the end of October and she wanted a Halloween themed party. So today while I was sulking because Renegade got rained out (or at least I'm guessing it did -- it was raining so badly here that we didn't attempt to go), I made the invites for Maddie's party. I printed up the details on white cardstock and attached that to some purple cardstock I had cut to match some envelopes I had. Then I made all those little orange squares, stamped them and attached them. I stamped the envelopes to match too. Yeah for papercrafting! Aren't the stamps cute? I sell rubberstamps -- did you know that? I've had my stamping website since long before I started a knitting blog. (Oh, it's www.stampingonline.com if you want to check it out.) And I used to love stamping. After a good chunk of my day started to revolve around the business aspect of stamping, I really lost interest. I guess I saw all those stamps as work instead of crafty fun. So it's kind of cool to do some stamping and enjoy it!